Once upon a time, I dreamed of living in a tiny but perfectly formed Parisian apartment on the top floor of an 18th century building, with whitewashed floorboards, ornate mirrors, and tiny spindly chairs. I’d live in the Marais and buy croissants for breakfast every day. Meanwhile, completely unbeknownst to me, my future Portuguese husband was happily living in a newly converted industrial-style apartment block in Manchester’s Ancoats district (at the time considered to be the edge of the Northern Quarter, but now a destination in itself) surrounded by modernist cubes of furniture. Fortunately for the harmony of our future married life, by the time we set up house together, some clever individual had invented the concept of eclectic décor, nicely heading off the potential interminable arguments over whether our sofa should have English rolled arms or clean contemporary lines. Proving the point – our 145 year-old Victorian house in south Manchester, to which we added a beautiful white rendered extension that our lovely architect described as “a modern white arm cradling the old house”. Our kitchen pairs cement floor tiles that are already acquiring a lovely patina, classic metro tiles, and a traditional Belfast sink, with whizzy modern appliances including an induction hob and a glass ceiling extractor fan, plus geometric brushed brass cabinet handles. In our living room we used a piece of salvaged vintage French wardrobe door to create a mantel shelf, which we use to display modern black and white artwork. 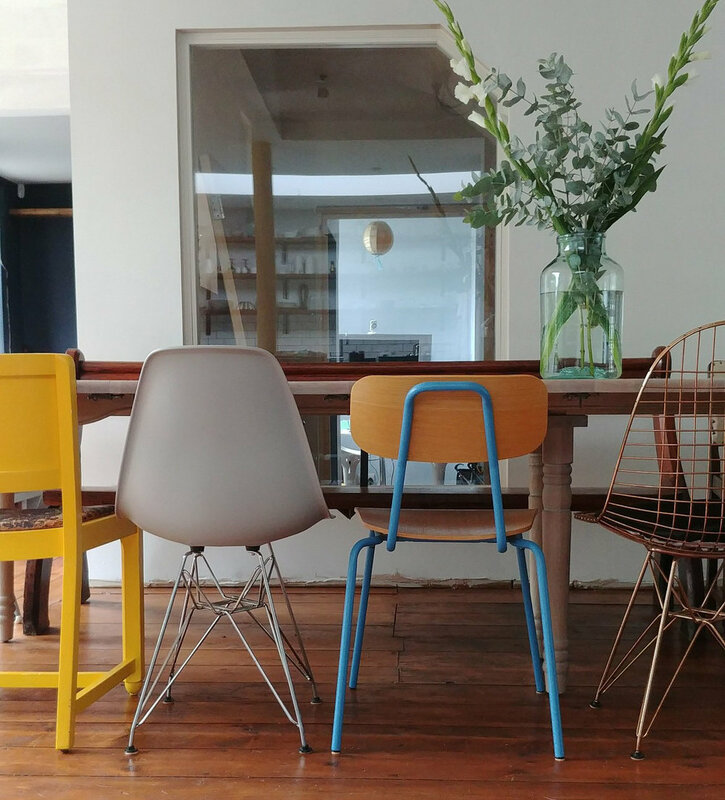 And at our dining table, upcycled vintage chairs sit comfortably alongside replica modernist design classics. When it comes to purchasing vintage furniture and accessories for our home, I usually turn to eBay, local charity shops, or salvage fairs. You can check out some of my upcycling efforts here. When I’m on the look-out for modern furniture, I generally prefer to make purchases in stores rather than online. With an older vintage piece, I always have the option to change the finish or the style by painting it, or changing the handles. With new furniture that needs to fit seamlessly and immediately into your existing scheme, especially larger items like chairs, sofas and beds, I think it’s really important to try things in person and choose fabrics from large samples, rather than trying to go purely on website imagery and tiny fabric swatches sent in the post. Last month I spent a lovely morning at BoConcept Manchester, a gorgeous independently-run furniture and accessories store with a modern Scandinavian aesthetic. BoConcept Manchester is part of the prominent Danish global furniture brand, BoConcept, which was originally founded back in 1952. The store in Manchester city centre, located on Great Ancoats Street, takes this proven design heritage and gives it a Manchester twist, showcasing stunning Scandi room-setups in a beautiful industrial building with a polished concrete floor. And with a true Mancunian welcome, we were even offered delicious blueberry pastries handmade that morning by David, BoConcept Manchester’s social media manager. I fell in love with this incredible curved chair, the Imola, shown here in buttery caramel leather with a matching footstool. Such a design icon. I need to find room at our dining table for one of these lovely Ottawa dining chairs – the leaf-shape and curved design along with the twig-like legs give such a nature-inspired organic look. As with all BoConcept Manchester furniture, the Ottawa chair can be customised, with a choice of seat colour and leg finish. The team at the Manchester store also offer a free no-obligation interior design service to help customers choose BoConcept Manchester furniture and accessories to fit perfectly into their homes, whether you want to select the perfect fabric or leather for a chair, or are decorating an entire room. How fabulous would one of these modern beauties look sitting alongside a lovely vintage upcycled carved wooden number? Bed, mirror, cushions, throws and rugs. Oh the rugs! Here’s a close up of the Rondo rug in multi-grey snuggled up underneath the Imola swivel chair. And look at this amazing handwoven Palencia wool rug – I love the nod to Moroccan style. Look at this incredible room set-up. Modular Copenhagen storage, the Fargo sofa, a nest of Bornholm coffee tables, the Stroc rug and a fluffy sheepskin. In my home I’d switch this up and place a vintage dresser unit behind the sofa, or swap the coffee tables for an upcycled piece made from an old piece of wood with hairpin legs. That’s the beauty of the BoConcept Manchester range – you can go all out with the Scandinavian look, or introduce a couple of furniture pieces or accessories into your existing scheme to create a relaxed, eclectic feel. Not to mention the suspended Tear flowerpots in brushed bronze. I’ll have three, please. I have a really exciting giveaway with BoConcept Manchester planned for later this month, so watch this space to enter! To whet your appetite in the meantime, I’m giving away these two gorgeous tea light houses. Two tea light houses on my mantelpiece. I love the gold relief of the organic tree design. Sitting pretty on a piece of antique carved French wood, next to my Grandma's vintage Wedgwood. To enter, please visit my Instagram feed and follow the instructions on the post. The winner must collect the tea light houses from the BoConcept store on Great Ancoats Street in Manchester city centre. This post is the first in a series that I am collaborating on with Boconcept Manchester via my blog and social media feeds. Please click here to view my disclosure policy.